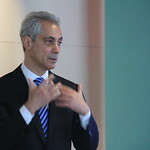 Chicago Mayor Rahm Emanuel is digging in his heels in the fight against President Donald Trump’s policies on so-called sanctuary cities, and other threatened municipalities might soon follow his lead. “Chicago will not be blackmailed into changing our values, and we are and will remain a welcoming city,” Emanuel said during the press conference. When asked for comment on the Chicago lawsuit, Department of Justice spokesman Ian D. Prior told Mic in an emailed statement that Emanuel’s priorities were out of line.